75 kids. From as young as 11 all the way to pre-College age. Building stuff in the controlled chaos of a mini-maker festival. Becoming experts, teaching each other, and using Hackasaurus tools to learn about how hacking and the web connect to topics they’re already interested in. 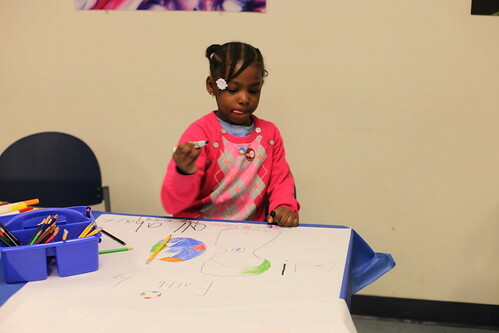 That’s what happened at the New York Hall of Science last week. Check out Jess Klein’s thorough and thoughtful post for a detailed account. 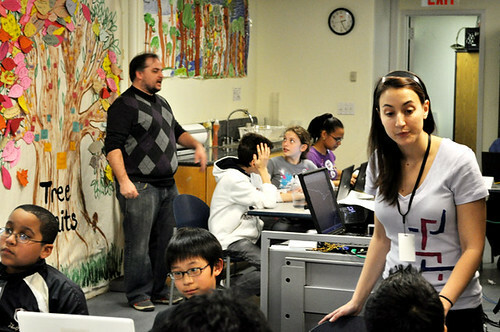 It’s our most successful and well-attended Hackasaurus event to date. And thanks to some stellar work from Mozilla’s Atul Varma and Dan Mosedale, it’s now easier than ever for participants to share their hacks. Using a new easy screen-sharing add-on, learners can post their hacks directly to the Hackasaurus Flickr stream with the touch of a button. Adding Lady Gaga’s face to your Facebook log-in page — and recording it for posterity — has never been simpler. "i hacked facebook to put lady gagas face on it :)" -- One of the hacks shared using the new easy-share functionality. Start with stuff participants are already interested in. 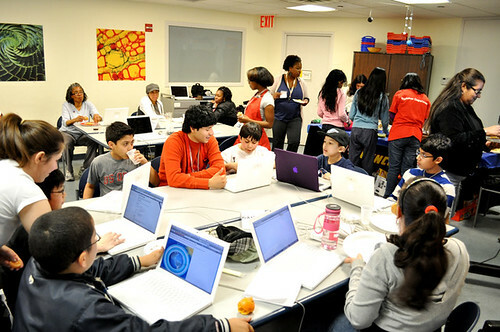 The event was framed less around “teaching kids to hack,” and more around a specific design challenge. Namely, creating representations of learners’ carbon footprint on the planet, which was part of a larger unit they were already working on. Use existing communities and event structures. Working with the New York Hall of Science (NYSCI) “My Carbon Footprint” project allowed the Hackasaurus team to provide an experience for a readymade audience, instead of building from scratch. Students help prototype exhibits about climate change for the Virtual Hall of Science, the kickoff project of My Carbon Footprint. Create a maker space and divide it up into stations. So that kids can self-select and focus on the aspect they’re most interested in. Make sure kids come away with shareable artifacts. That’s why the new easy-share functionality is so important. Many kids don’t have their own Facebook or email accounts either, so easy sharing is crucial. Build in opportunities for kids to teach their parents. When parents came by to pick up their kids, the kids got to teach their folks. Cool huh? Mix digital and analog materials. For a range of different experiences. Draw some stuff that can be digitized and incorporated into web pages. Get your hands dirty. Bridge the physical and digital.